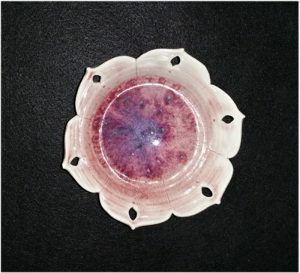 February’s feature item is “Jewels.” A porcelain bowl, viewed here from the top so you can fully see the inside. It is a 6” in diameter and 3” high. The rim is cut in the lotus flower pattern with jewel shaped piercings. It is glazed in copper red with green speckles. Nice piece for Valentine’s Day. $48. Joyce Inderbitzin dedicates her life to creating handcrafted stoneware and raku pottery. Located in Yardley, Pennsylvania, Joyce designs beautiful, original clay pieces. Joyce has forty years of experience built around great education and apprenticeships with well-known artists. This education has led to her becoming a seasoned clay artist. Joyce makes every piece of stoneware and raku pottery by hand, so no two pieces look exactly alike. Stoneware pottery remains a popular choice for Joyce’s customers. Many people use stoneware for its amazing cooking capabilities, but they also enjoy it for its natural beauty. Because of this, Joyce makes sure to incorporate inviting colors into each piece. Raku is one of the most interesting methods for making clay products. Using the raku method, Joyce smokes or flames pieces, giving each final product a different look. The raku pieces that she creates, have stunning colors and can be an ideal centerpiece. Many of her raku pottery pieces have a sculptural component. It’s February! Valentine’s month. I have a new piece fitting for the month, perfect to give your loved one! Take a look above.